Since Wireless N (802.11n) is relatively a new technology compared to Wireless G, many of the older laptops don't come with built-in Wireless N adapter. So, you need to get a USB adapter that you can plug into your laptop in order to get the full throughput of your Wireless N router. 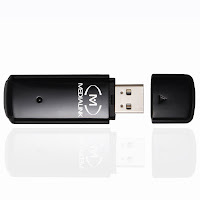 Medialink Wireless N USB Adapter has been one of the popular choices among tech shoppers. Didn't work with a Windows7 64-bit laptop. Takes forever to connect to the router. Poor connection speeds, both upload and download. Unable to connect to Netgear router from WindowsXP laptop or desktop. Doesn't work with 5GHz dual band Wireless N routers which are most common, works only with 2.4GHz routers. Uninstalling Medialink software didn't go cleanly. It kept getting automatically re-installed during the next reboot. Works with Verizon's FiOS Wireless N router only when in the same room. Signal strength drops very quickly when moved to another room. Not fully compatible with Linux or Mac. Not reliable. Loses connection either when idle or when heavily used. Performed much more poorly than a Linksys Wireless N or Wireless G USB adapter, at the same location. Poor signal strength at less than 50 ft from the router. Unable to setup a homegroup across two Windows7 computers using Medialink Wireless N adapters, but works fine when switched to wired connection. Connection speed varies widely - from 130Mbps all the way down to 1Mbps. Medialink adapter randomly loses its settings after some days, weeks or a month. Need to reprogram it to make it work, but then again loses programming after some time. Didn't work with a 5-year old Windows Vista laptop. Periodically loses connection with AT&T Wireless router even though the signal strength seems to be good. Asked for Microsoft C++ disk during driver install, go figure. Worked more poorly than a desktop add-on card. Windows Vista seems to need a different method for driver installation, but at the end it complained that some class was not found. The adapter wouldn't work when plugged in. Driver wouldn't install on a Windows7 laptop. After a little over a month of usage, the Medialink wireless adapter started overheating - after a few minutes of turning on, it falls to 1 Mbps download speed from 150 Mbps. Doesn't work if Norton 360, which is one of the most common internet security software, is installed on the computer. Need to reboot Wireless router everyday in order to connect Medialink adapter to it. Doesn't work well one floor above where the router is located. Driver not compatible with Windows7 64-bit, even after downloading latest patches from Microsoft. Adapter doesn't work. No speed improvement seen when upgrading from laptop's built-in Wireless-G to Medialink Wireless N USB adapter. Computer keeps rebooting after Medialink adapter is plugged into the USB port. Breaks easily even if accidentally bent slightly while plugged into laptop. Remembers only the password of the Wireless router to which it connected last. So, if you take your laptop periodically between two routers, like work and home, you will have to keep entering passwords each time to connect. Started dropping connection every 5 minutes, after working OK for two weeks. As you can see, the Medialink Wireless N USB adapter seems to have a wide range of issues - from connection problems to driver issues to incompatibility and reliability problems. In many cases, it seems to perform more poorly than even a slower Wireless G adapter. Customers who get frustrated and return their Medialink adapters found these adapters to perform much better, and much more stable. Linksys AE1000 Wireless N USB adapter. Customers agree that this adapter does show the quality of its brand name. D-Link DWA-125 USB adapter Good, stable adapter. Edimax Nano size USB adapter. Tiny, but performs well, no fear of knocking it over.